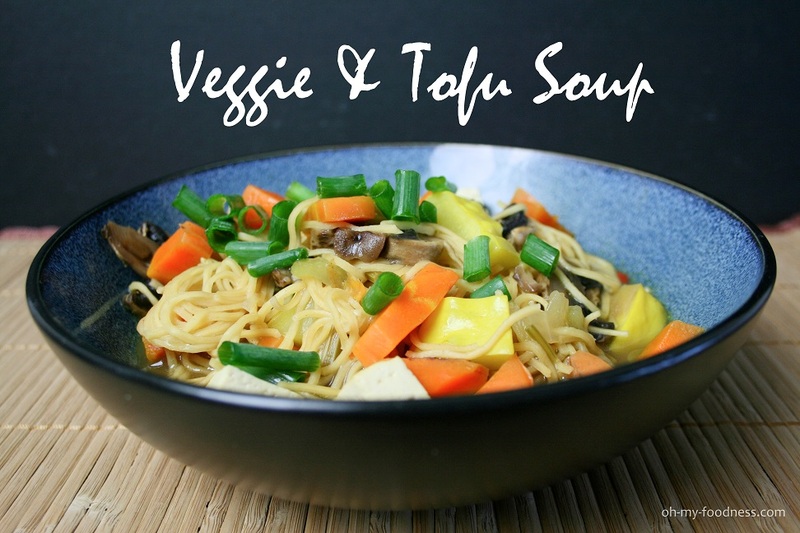 Veggie & Tofu Noodle Soup #30minutemeals | Oh My Foodness! Since living in Torrance, California, Cobalt and I have found some pretty authentic Thai, Korean and Japanese restaurants around town. Not having many of the Asian condiments at home, I find the recipes difficult to recreate authentically. Still, I really enjoy cooking Asian-esque meals, inspired by random veggies in the fridge, some veggie broth, a box of tofu and a handful of noodles (you can use ramen, udon or vermicelli). A meal can be thrown together in 30 minutes and taste so comforting. While this soup is quick, the key is to let the broth simmer most of the cooking time to allow the flavors to really shine. Additionally, only cook the amount of noodles you will eat in one sitting or store noodle and soup leftovers separately so the noodles don’t get mushy. Another vegetarian meal for the win! Asian-themed Veggie Noodle Soup, so comforting on a chilly or sad day. Boil and salt some water in a large pot for the pasta. Cook pasta according to the package or to your liking. In another pot, saute the onions and mushrooms until they begin to brown -- about 5 minutes. Then, add the celery and carrots and saute for another few minutes until they begin to soften; finally, add the squash and cook all the veggies for a minute or two. Add the veggie stock and tofu; flavor with a bit of soy sauce, ground ginger and black pepper. Let the soup simmer for 15 minutes on low to let the flavors mingle. Serve veggies over drained noodles and garnish with green onions. If there's leftovers, make sure to store the veggies and noodles separately so the noodles don't get soggy. ← Winter in LA + Chili Time!